Museum Quality Ming Dynasty Tomb pottery warrior, 82-83 cm! Finest known Ming Dynasty Tomb pottery warrior, TL tested 1420! Finest and largest known Ming Dynasty Tomb pottery warrior, 83 cm! Temporary pictures of the largest Tomb pottery warrior, we've ever seen or heard of! Very rare ancient Early bronzeage Cypriot pottery vessel, ca. 2300 BC! A very rare pottery Amphora / vessel, late 3rd. millenium BC! This vessel is very early so rare in this size and intact condition: In redish terracotta with three legs and two looped handles. Size: 18,5 cm. wide and 16,5 cm. tall. Condition: Choice, some minor rim chips othervise completely intact. A rare and unusual pair of Tomb pottery figures of Green Pigs, Chinese, dating to the Ming Dynasty 1368-1644 AD. The figures are very cute and attractive and finely glaced with good details. The glace in bright green. A beautiful bronze figure of a standing godess with long ponytail, Southern India, 18th.-19th. century AD. Very attractive and detailed figure with fine cloths and wearing Jevellery. She is standing on a small round podium, very erect. The strange small piece in her left hand could have been connected to something else of bronze or another material now lost(?). Condition: Fine and very well-patinated. Rare India bronze figure of double female godess, 16th.-17th. cent! A very rare bronze figure of an Indian Godess, a rarely depicted Hindu deity, perhaps Meenakshi, a form of Parvati ca. 16th.-17th. century. A superb gilt bronze figure of a General as Guardian, ca. 18th. century. The figure finely decorated and excellent details of helmet and armor and with grim expression, baring his teeth. He is standing on a square garlanded podium and with hands folded in prayer. Condition: Choice, finely preserved gilt with an attractive patina and wear. A fine pair of matching Horseshoe, tomb pottery model of the Ming Dynasty, 1368-1644 AD. A pair of large and finely decorated chairs, including criss-cross patterns on the seats and fine cobolt and torquise glacing. Size: 18,5 cm. tall and 13 cm. wide. Condition: Superb, finely preserved pigment. An ornate Incense Burner with two fighting Dragons, Ming Dynasty 168-1644 AD. Note that we have a similar listed, if you like the matching pair! 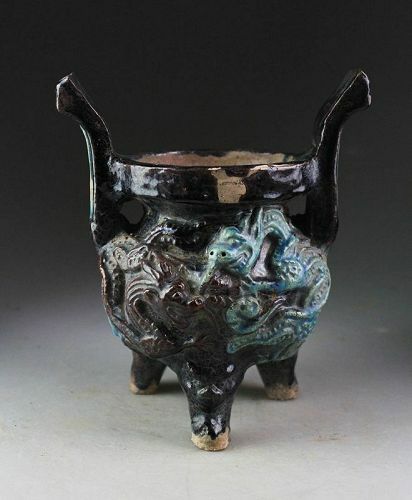 The vessel stands on three stout legs decorated with animal heads. Fine decoration of two fierce dragons in each glace - dark blue and torquise colours. A very handsome vessel with very finely crackled glace and patina. Size: 20 cm. tall and 17 cm. wide. Ex. Danish Private Collection, comes with COA. Rare Chinese Late Song Dynasty, Jade Horse & Monkey pendant! A very rare and attractive Jade carving pendant of a Horse and Monkey, Late Song-Yuan Dynasty, 12th.-13th. Century AD. 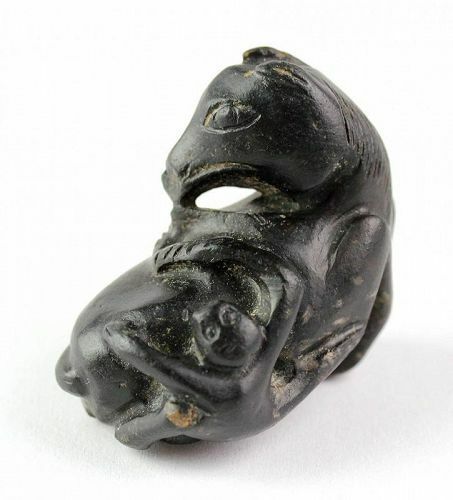 An ancient gem of a jade carving in the fine Late Song Style with the long arms of the monkey and peculiar head of the horse. Done in a fine, now almost black Nephrite stone. Size: 4,8 cm. long and 4 cm. tall. Condition: Choice!, nice even wear and fine patination.